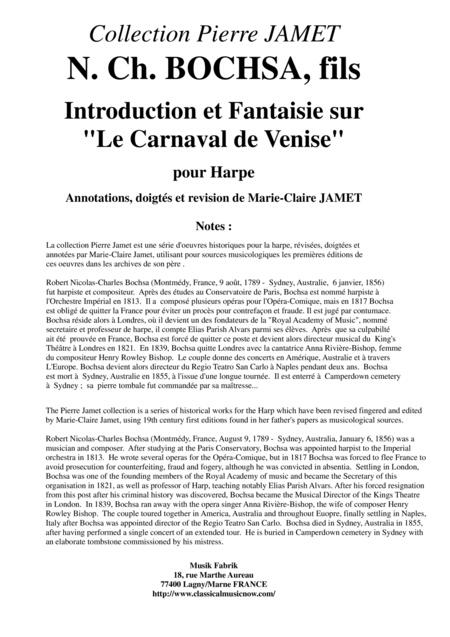 The Pierre Jamet collection is a series of historical works for the Harp which have been revised fingered and editedby Marie-Claire Jamet, using 19th century first editions found in her father's papers as musicological sources.Robert Nicolas-Charles Bochsa (Montmédy, France, August 9, 1789 - Sydney, Australia, January 6, 1856) was amusician and composer. After studying at the Paris Conservatory, Bochsa was appointed harpist to the Imperialorchestra in 1813. He wrote several operas for the Opéra-Comique, but in 1817 Bochsa was forced to flee France toavoid prosecution for counterfeiting, fraud and fogery, although he was convicted in absentia. Settling in London,Bochsa was one of the founding members of the Royal Academy of music and became the Secretary of thisorganisation in 1821, as well as professor of Harp, teaching notably Elias Parish Alvars. After his forced resignationfrom this post after his criminal history was discovered, Bochsa became the Musical Director of the Kings Theatrein London. In 1839, Bochsa ran away with the opera singer Anna Rivière-Bishop, the wife of composer HenryRowley Bishop. The couple toured together in America, Australia and throughout Euopre, finally settling in Naples,Italy after Bochsa was appointed director of the Regio Teatro San Carlo. Bochsa died in Sydney, Australia in 1855,after having performed a single concert of an extended tour. He is buried in Camperdown cemetery in Sydney withan elaborate tombstone commissioned by his mistress.ABOUT MARIE-CLAIRE JAMET: After having earned her First Prize in Harpe and her First Prize in Chamber Music from the Conservatoire National Supérieur de Musique de Paris, Marie-Claire Jamet was the Principal Harpist with the Orchestre National de Radio France, and then First Harp Solo with the l’Ensemble Inter-Contemporain under Pierre Boulez. 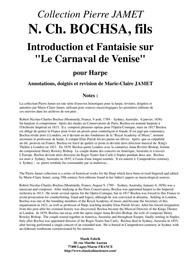 She now has an active career as a International Harp Soloist.Marie-Claire Jamet has given more than 2000 concerts in the US, in Europe, in Japon, in Indian, in Russia, in Canada, in Australia etc...She has given premières of many works for Harp and Orchestra, Flute and Harp and Solo Harp, including works by: Banquart, Boulez, Damase, Françaix, Ishi, Lesur, Ton-That Tiët, Taïra etc... and has played under the diretion of such noted conductors as Munch, Bernstein, Célibidache, Ozawa and Pierre Boulez with whom she performed the Danses of Claude Debussy notably at the Salzbourg Festival and at the Scala de Milan Opera House.From 1981 to 1995 she was the professor of harp at the C.N.S.M. of Lyon then at the C.N.S.M. of Paris was well as at the Ecole Normale de Musique de Paris.Her numerous recordings have won many awards.